Highly innovative and showing all the classic technical capabilities of the MINOX company is the best way to describe the MINOX Macroscope. This unique compact miniature telescope, measuring just 92 x 57 x 44 mm that fits neatly into the palm of the hand, gives the user not only high optical performance but an extremely close-focus distance of only 35 cm. In combination with the 8x magnification, the MINOX MS 8x25 Macroscope allows a close-up detailed study of all kinds of subjects and objects, ensuring that the user can even observe wildlife and insects in great detail at close range without disturbing them. Enter the world of macro with a highly portable and compact mini-telescope! The short and compact telescope body, designed by Volkswagen, is destined to meet many other demands. With a field of view of more than 114 m, the compact MINOX Macroscope is just at home being used as a 'normal' telescope, just as you would a full sized ‘scope. Viewing a historical tower on a sight-seeing trip or big events in a stadium or concert hall, the new compact Makroskop is ideal. It also has the added advantage of being handy and easy to use for partially sighted people. Despite its lightweight, around 150 grams, the Macroscope features tough rubber armouring to protect against everyday wear and tear and along with a special sealing technique is internally purged with special Argon gas to not only minimise internal corrosion and prevent internal fogging during quick temperature or humidity changes, it also ensures that it remains waterproof in bad weather conditions and even in water down to 5 metres. For those who wear spectacles, the full field of view is visible due to the extended exit pupil. The twist-up/twist down eyecup is an important feature for both spectacle and non-spectacle wearing users. 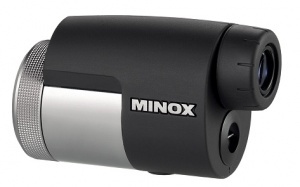 The MINOX Macroscope is supplied complete with a stay-on-case and strap together with a 5 year warranty and is available in black or silver/black.